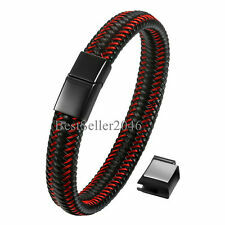 Product Specification: Metal Stainless Steel Material Leather Style Bangle Color Black Red Chain Length Adj, 8"(20cm)-8.46"(21.5cm) Chain Width 0.47"(12mm) Package Included: One Bracelet One blue bag Features: . Material: Brass & PU Leather. Clasp: Bayonet. Bead Size: N/A. Color: Black & Silver. Materials:Stone Crown. Beads size:8MM. 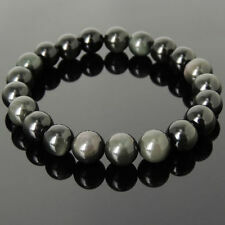 Item Number:WAB249-K.
Gemstones: Black Lava (10mm), Hematite (10mm) & Golden Quartz (10mm). 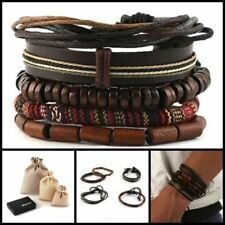 Style: Beaded (On 1.0mm super strong & stretchy elastic cord). 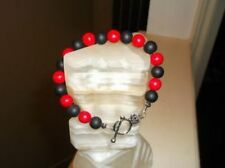 BOLD Handcrafted Gemstone Bracelet. Handcrafted with Natural Gemstones. Style : Bangle. 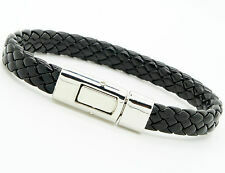 Clasp Type : Magnetic Clasp. Bracelet Length (Approx.). 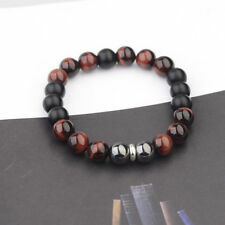 Gemstones: Matte Black Onyx (10mm), Lava (10mm), Tigers Eye (10mm) & Hematite (9mm). Style: Beaded (On 1.0mm strong & stretchy elastic cord). Handcrafted Gemstone Bracelet. Add this beautiful piece to your wardrobe. Materials:Stone Crown. Item Number Color:As picture. Gemstones: Matte Black Onyx (8mm), Hematite (8mm) and Man-Made Malachite (8mm). Style: Beaded (On 1.0mm super strong & stretchy elastic cord). Handcrafted with Natural Gemstones. 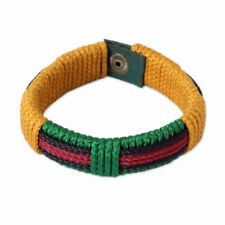 Bracelet fully customizable. Material: Stainless Steel & Rubber. Bead Size: N/A. Color: Black & Silver. 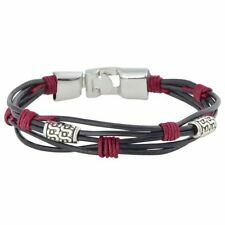 MENDINO Men's Stainless Steel Leather Bracelet Braided Clasp Bangle 8" 8.5" 9"
Bracelets Size:Can adjust 5.5" to 8.5". Beads size:8mm. Color:As picture. 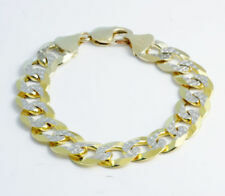 Bracelets Size:Can adjust 7" to 8.5". Color:As picture. Beads size:8mm. Item Number:WAB206-1 Package Included:1 Piece Size: About 6.5-7.5 in Color:As picture Materials:Natural Stone Beads size: 8MM Please Do Not Leave us negative feedback or Neutral feedback or low score on detail rating selling, If you have any questions, please contact us before you are doing this, thank you very much for your understanding. 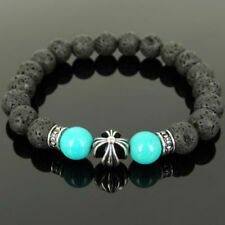 Bracelets Size:Can adjust 5.5" to 8.5". Color:As picture. Beads size:8mm. 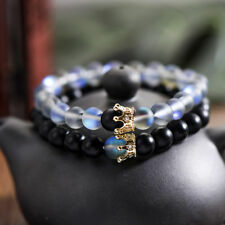 Gemstones: Matte Blue & White Sodalite (10mm), Matte Gray Labradorite (10mm) and Black Lava (10mm). Style: Beaded (On 1.0mm super strong & stretchy clear elastic cord). Add this beautiful piece to your wardrobe. Gemstones: Matte Tigers Eye (10mm). Style: Beaded (On 1.0mm super strong & stretchy clear elastic cord). Add this beautiful piece to your wardrobe. Dress it up for special occasions. Length: Approx 8" Long (as shown). 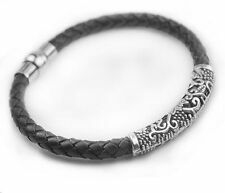 Product Specification: Metal Stainless Steel Material Magetic Stone Style Magentic Health Bracelet Color Silver Gold Chain Length 8.46"(21.5cm) Chain Width 0.27"(7mm) Package Included: One Bracelet with Free Link Removal Tool One blue bag Features: . Beads size:8MM. Item Number:ABJ028. Size: about 6.5-7.5 in. Solid 925 Sterling Silver 4mm Multicolor Rainbow Gay Pride Tennis Bracelet 6-9"